Germany: Henryk M. Broder next Central Council of Jews President ? The German Jewish author and journalist Henryk M. Broder's announcement last week that he plans to run for the presidency of the 120,000-member Central Council of Jews has riveted German society, provoking a nationwide media debate about the political direction of the council. Broder cited among the reasons for his candidacy that Germany takes quite casually "what Iran's President Ahmadinejad might intend for Israel." He added, "Our problem is not the last Holocaust, the truth of which is not in question, but the genocide taking place before our eyes in Sudan. We don't need more Holocaust memorials, but an active policy in the service of human rights, without political consideration of economic interests." "He throws his kippa in the ring" was the headline of Broder's article last week in the daily Der Tagesspiegel, in which he argued for a radical shift away from a "fixation on the past" and issued unusually sharp criticism of the central council's leadership. Broder, who writes for Der Spiegel and enjoys celebrity status because of his best-selling book about Europe's capitulation to political Islam and witty commentaries dissecting German society, said the central council finds itself in a "pitiful condition." He called the present leader of the council, Charlotte Knobloch, "overwhelmed" and "unfit" for the role of president. Broder cited Knobloch's reaction to go on vacation instead of promptly criticizing German President Horst Köhler's decision to award the Federal Cross of Merit,the country's highest honor, to Felicia Langer, an "anti-Semite" and hater of Israel. He also lampooned Knobloch's refusal to attend a Shoah remembrance event in the Bundestag because she was not seated in the first row. Broder's outlined his principal criticism as "the central council acts as a remorse-receiving body and issues certificates of respectability, about which it has no inhibitions in any direction." Knobloch told the Münchner Merkur newspaper that "criticism is good, but it should be constructive and not serve self-interest... In contrast to all previous central council presidents, Broder has no experience working in the community." The prominent historian Michael Wolffsohn, who recently served along with Knobloch on the executive committee of the Munich Jewish community, resigned his post and said, Broder's "criticism is based on facts." Wolffsohn told NDR Info radio, "Ms. Knobloch is visibly not visible and rarely argues intellectually. And that is, of course, in a situation in which German Jewry needs a intellectual orientation, and that is more necessary than ever." Broder has received a respectable wave of endorsements. He has secured the support of two local Jewish communities for his candidacy, and Lala Süsskind, head of the largest regional community, the 12,000-member Berlin Jewish community, welcomed Broder's campaign. "That is an exciting thing. Broder is a very pleasant conversation partner. He is smart and amusing," Süsskind said. However, Michel Friedman, a television talk show host and a former vice president of the central council, expressed doubt that Broder has the necessary diplomatic skills for the presidency. Reached on his mobile telephone in the Netherlands, Broder told The Jerusalem Post that he definitively plans to campaign for head of the council. One of the more controversial aspects of Broder's platform is to abolish the section of German law that outlaws the denial of the Holocaust. He argues that while the law initially had good intentions, it now simply advances the martyr status of a few crackpots such as David Irving and neo-Nazi Horst Mahler, who deny the Holocaust. Broder is a one of a handful of intellectuals in Germany who has drawn attention to the genocidal threats facing the Baha'is in Iran, whom the Iranian regime has systematically targeted. He also cited the German society's neglect of the Baha'is as an additional reason for tossing his kippa into the ring. Wiesenthal Centre to Norwegian PM : "Condemn University of Science and Technology (NTNU) and Its Rector Torbjorn Digernes"
"Condemn Norwegian University of Science and Technology (NTNU) and Its Rector for Campaign to Disestablish Jewish Self-Determination"
In a letter to Norwegian Prime Minister, Jens Stoltenberg, the Simon Wiesenthal Centre's Director for International Relations, Dr Shimon Samuels, deplored "a new stage in Norwegian incitement to Jew-hatred, the outrageously anti-Israel bigotry of the Middle East seminar at the Norwegian University of Science and Technology (NTNU) in Trondheim." Samuels continued, "The virus of antisemitism in Norway's media, unions, NGOs and even government circles is now infecting academia. NTNU has deformed free and open scholarly discourse based upon mutual respect into a campaign of hate propaganda, led by masters of disinformation who exploit their academic credentials to call for boycott of their colleagues who happen to be Israeli. Most disturbing is the role of NTNU's Rector, Torbjorn Digernes, who has declared his support for this campaign." - Letter to VG: Will NTNU boycott Israel? - NTNU rector Torbjørn Digernes: "Seminar series is praiseworthy initiative"
- Ilan Pappé dismisses Digernes’ objectivity-defense:"We are all political"
- NTNU student to dean: "We will not give in"
- Why should Digernes resign ? "Israel is, allow me to say, a member of the European Union without being a member of the institutions. It’s a member of all the EU programs, including the research and technology programs." JERUSALEM (EJP)---EU foreign policy chief Javier Solana said Israel has a closer relationship with the European Union than EU candidate country Croatia. "Israel is closer to the European Union than any other country in the world outside Europe", he told the Israeli Presidential Conference in Jerusalem last week. Solana pointed to the "deep and close" cultural, historical and trade ties and active participation in all its programmes. "Israel is, allow me to say, a member of the European Union without being a member of the institutions. It’s a member of all the EU programs, including the research and technology programs", he said. Croatia is candidate to EU and could join the union in 2012. "I don't see the president of Croatia here," Solana said, looking out over the audience. "Don't tell him that," Solana added. Croatian President Stjepan Mesic was also attending the conference in Jerusalem as part of a visit to Israel. "François Houtart (Belgium) for his life-long commitment to world peace, intercultural dialogue, human rights and the promotion of tolerance, and in recognition of his outstanding efforts to advance the cause of social justice in the world. Mr Houtart is an ardent promoter of North-South cooperation and the founder of the Tri-Continental Centre (CETRI), a non-governmental organization renowned for its work on development issues and in the International Council of the World Social Forum. Known throughout his life as a defender of human rights, he has contributed significantly to the advancement of the inter-faith and inter-cultural dialogue. As a noted sociologist of religions and theology, he has authored numerous publications and given lectures in over 100 universities around the world. An honorary member of the Academy of Sciences of Vietnam and Cuba and a member of the Commission on Struggle against Racism of the Ecumenical Council of the Churches, he has served as President of the Committee for Human Rights in Burundi (1986-1992); founder and director of the international review "Social Compass" (1960-1990); and President of the International League for People’s Rights (2003-2008)." On the Centre Tricontinental (CETRI), one can find : 17 articles on Palestine, 0 article on Burundi (in spite of the fact that, according to the statement, the UNESCO prize was awarded for the priest's commitment to the advancement of human rights in Burundi), 3 articles on the Congo, 0 article on Soudan, 9 articles on Sri Lanka etc. It's strange the little attention Burundi, the Congo et Rwanda receive because they were Belgian colonies, and there is a mutually strong link between citizens of these countries and Belgium. We had a look at the sources of the articles posted on the CETRI blog and we were not disappointed: Electronic Intifada, Le Monde Diplomatique, Counterpunch (surprise surprise Counterpunch ), Palestine Monitor, etc. "Despite the blood libel, the National Federation of Algerian Journalists presented him with an award for excellence. Bostrom, in his acceptance speech, charged that 1,000 Arabs were victims of organ harvesting since 1960." A nationalist group has appealed to Interior Minister Eli Yishai (Shas) to prevent the entry of Swedish journalist Donald Bostrom, who spread the blood libel alleging that IDF soldiers sold organs of Arab terrorists. Bostrom published his allegations in August and is planning to arrive in Israel next month for the Dimona Conference in the Negev. Im Tirtzu (If You Wish) wrote to the minister, "Everyone understands the difference between his poisonous anti-Semitic articles and freedom of expression" and knows that his articles "are a modern blood libel that recall the same form of anti-Semitism in Europe in the Middle Ages. Anyone who thinks this is freedom of expression should return to school learn history." The group asked Yishai "to take all possible measures to prevent this journalist... from stepping foot on the Land of Israel." Last week, a media watchdog official wrote in The Wall Street Journal that Bostrom’s allegations "are ugly, false, and harmful to peace efforts." Andrea Levin, executive director of CAMERA, (Committee for Accuracy in Middle East Reporting in America), that Bostrom’s article in Aftonbladet, Sweden’s leading daily, "has quickly metastasized to mainstream Muslim media, spawning cartoons of Jews stealing body parts and drinking Arab blood. These have been published in Syria, Qatar, Jordan, the United Arab Emirates, and Oman, to name a few." Last month, an Algerian newspaper claimed that gangs directed by Jews round up and smuggle Algerian children into Israel, where they sell their organs. Iranian Press TV reported, "An international Jewish conspiracy to kidnap children and harvest their organs is gathering momentum." Levin noted that despite the blood libel, the National Federation of Algerian Journalists presented him with an award for excellence. Bostrom, in his acceptance speech, charged that 1,000 Arabs were victims of organ harvesting since 1960. After Israeli officials and media harshly condemned the report by Bostrom, who admitted that his report was unconfirmed and based on unsubstantiated claims by Arabs in Judea and Samaria, Aftonbladet stated there was no evidence of the charges but still demanded an international inquiry. 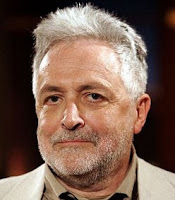 However, Levin wrote, "Francis Delmonico, a Harvard surgeon and international transplant specialist who was quoted in the Aftonbladet article on the issue of organ theft in general, told me he found the Aftonbladet charges completely inconsistent with his extensive interaction with Israeli doctors…. Like many others, Dr. Delmonico noted that Mr. Bostrom's scenario in which Ghanem [an Arab] was supposedly shot before having his organs removed for trafficking was ‘not feasible from a surgical vantage.’" Ghanem’s family refuted several "facts" that Bostrom wrote in his original accusations. The journalistic ethos of the Axel Springer publishing house - Europe's largest media conglomerate - is governed by a set of principles spelled out in the employment contract of each journalist, one of which advocates "the support of the State of Israel and its existence and reconciliation between Germans and Jews." In an exclusive, wide-ranging interview with The Jerusalem Post earlier this month, Dr. Mathias Döpfner, CEO of the Berlin-based Axel Springer AG media empire and a self-described "non-Jewish Zionist," explained the philosophy behind Springer's support for Israel and his coordination of the 10th annual European-Israel Dialogue taking place for the first time in Israel on Monday and Tuesday in Jerusalem. According to Dr. Döpfner, Axel Springer (1912-1985), the self-made founder of the media giant, "thought that a new Germany can only develop if it is somehow defining its relationship to Israel." He clearly said that "the Holocaust cannot be compensated, but in order to find a new self-definition, Germany has to support from now on the State of Israel and its people." The magazines and daily newspapers of the Axel Springer publishing empire span Europe, and within Germany its mass-circulation Bild newspaper reaches more than three million readers. German media critics argue that within a European media landscape filled at times by shoddy and a one-sided press coverage of Israel, Axel Springer has been cutting against the grain by presenting a refreshingly balanced and objective view. "Israel and Europe should have an understanding of absolutely common interests in the defense of democracy and the values of the free Western world," Döpfner told the Post. "Israel is the bridgehead of democracy in the Middle East. So it is in the interests of Europe to support it and to strengthen it. We share the same cultural roots and we share the same security interests and foreign policy interests. Let's bring it closer together," he said. In this vein, Springer AG jump-started the European-Israeli Dialogue 10 years ago, to foster "a political, social, cultural and scientific dialogue" that has "brought together business, media, politicians, scientists, artists, business people from major European countries," Döpfner said. The Dialogue's founding statement said that "Israel should be a member of the EU," he said. As a result of Döpfner's success in running the European-Israeli Dialogue, former Prime Minister Ehud Olmert and European Commission Vice President Günter Verheugen turned to him in 2007 to chair the European Union-Israel Business Dialogue. Döpfner said the aim of the EU-Israel Business Dialogue "is to bring together Israeli and European business people to talk to about common interests with regard to their businesses. It can be very concrete. They can talk about joint-ventures. But also to talk to about common interests with regard to a political frame in which they can start and grow successful businesses. In the end, it leads to a closer relationship and more reliable support of European nations and the European Commission of Israel." Last year, Axel Springer's headquarters hosted the EU-Israeli Business Dialogue, which showcased 15 Israeli companies from the new media sector to German visitors. Döpfner added that "it is very important that we, on the one hand, never forget about Germany history... and what Germany has done, and because of that we have a special responsibility to support Israel and this is something we have to continue from generation to generation to make sure that it will never be forgotten. On the other hand, I think it is absolutely vital to define apart from that historical obligation from Germany, and from other European countries, a future-oriented interest in Israel." "It [the book] might offend Jews, but that doesn't really matter to me." "The Bible is a manual of bad morals [which] has a powerful influence on our culture and even our way of life. Without the Bible, we would be different, and probably better people." 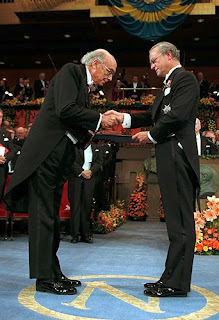 Speaking at the launch of his new book "Cain", José Saramago, who won the 1998 Nobel Prize for Literature, said society would probably be better off without the Bible. Roman Catholic Church leaders accused the 86-year-old of a publicity stunt. The book is an ironic retelling of the Biblical story of Cain, Adam and Eve's son who killed his younger brother Abel. Saramago attacked "a cruel, jealous and unbearable God (who) exists only in our heads" and said he did not think his book would cause problems for the Catholic Church "because Catholics do not read the Bible. "It might offend Jews, but that doesn't really matter to me," he added. Father Manuel Marujão, the spokesman for the Portuguese conference of bishops, said he thought the remarks were a publicity stunt. "A writer of José Saramago's standing can criticise, (but) insults do no-one any good, particularly a Nobel Prize winner," the priest said. Rabbi Elieze Martino, spokesman for the Jewish community in Lisbon, said the Jewish world would not be shocked by the writings of Saramago or anyone else. "Saramago does not know the Bible," the rabbi said, "he has only superficial understanding of it." The author caused a scandal in Portugal in 1992 with "The Gospel According to Jesus Christ." The book depicted Jesus losing his virginity to Mary Magdalene and being used by God to control the world. "The academic boycott of Israel is "a call upon intellectuals and academics worldwide to comprehensively and consistently boycott all Israeli academic and cultural in situations as a contribution to the struggle to end Israel’s occupation, colonization and system of apartheid" ... Belgium is not an exception ... A number of individuals of conscience have decided to invite Samia Botmeh to hold a speaking tour of Belgian Universities." 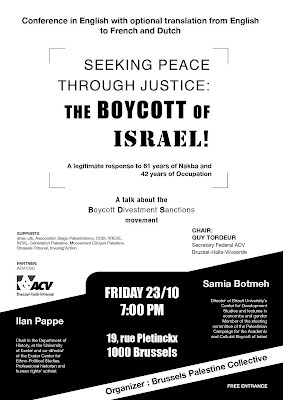 After, Belgian Christian unions support "Boycott Israel" conference with Ilan Pappé and Samia Botmeh, it is the universities' turn to debate the issue. In April 2004, in light of Israel’s persistent violations of international law and given that all forms of intervention and peace-making had failed to convince or force Israel to comply with humanitarian law, a call was issued in occupied Palestine for a boycott of all Israeli academic and cultural institutions until it complies with International Law and Universal Principles of Human Rights. A year later, following the initiative of the Palestinian Academic and Cultural Boycott of Israel (PACBI), another call was issued by nearly two hundred organizations from the Palestinian Civil Society for a broader policy of Boycott, Divestment and Sanctions against Israel. The academic boycott of Israel is "a call upon intellectuals and academics worldwide to comprehensively and consistently boycott all Israeli academic and cultural in situations as a contribution to the struggle to end Israel’s occupation, colonization and system of apartheid." Yet the very idea of an academic boycott might seem audacious and sensitive, and rightly so, for many scholars and universities that struggle precisely for the right of freedom of expression and exchange of knowledge. The academic boycott of Israel thus raises a number of questions such as why is there a need to Boycott Israel? What is the nature of the proposed boycott? Why Israel? Or what are the conditions of academic freedom in occupied Palestine as oppose to Israel? Today the Academic and Cultural Boycott, and the broader Boycott Divestment and Sanctions campaign, has gathered a remarkable international support that and it has achieved numerous and significant victories all over the world. Belgium is not an exception and several cultural institutions, organizations, and individuals openly advocate for the BDS in its various forms, and are working hard to raise awareness and support for the call made by the Palestinian civil society. Yet the rationale and the terms of the call for Academic boycott of Israel remain often unclear. This brings about tremendous confusion and triggers heatedly discussions around its motivation, legitimacy, and-or effectiveness. In order to address the misinformation and uncertainties surrounding the Academic Boycott of Israel and the rising interest among University staff and students, a number of individuals of conscience have decided to invite Samia Botmeh to hold a speaking tour of Belgian Universities. Samia Botmeh is director of Birzeit University’s Center for Development Studies and lecturer in economics and gender studies. She is also a member of the steering committee of the Palestinian Campaign for the Academic and Cultural Boycott of Israel (PACBI). (Eric David is the spiritual father of the calamitous and now defunct Belgian Universal Jurisdiction Law, a.k.a. "a law against justice"... (see below).) A previous debate was held at the ULB in May this year. "Bouhlal says that we "should avoid crying wolf all the time and focus on the real abuses"." "At the age of 20, when I was a Marxist, I was not a big supporter of the right to diversity. I evolved. And what made me turn around is precisely the conversations I had with representatives of the Jewish community. It saddens me, today, that they deny the right of diversity to Muslims." According to Joël Rubinfeld, chairman of the CCOJB (Umbrella Organization of Jewish Institutions of Belgium), the phrasing is vague, "but it's clear that he stigmatizes a community unnecessarily". He points out the the number of anti-Jewish acts has increased since 2000. Rubinfeld says he doesn't understand what right to diversity the Jews have enjoyed. What privileges have they received that they would deny their fellow Muslims, he asks. And who among the representatives of the Jewish community denies this alleged right to diversity to the Muslim community in the country? The president of the CCOJB says that this statement is dangerous, since "it instills in the minds of our fellow Muslims the treacherous idea that the Jews are their opponents on the way to successful integration, setting one community against another". Rubinfeld says that Phillippe Moureaux has a lot of prestige among the Muslims, and they can now infer from his words that all their problems are the fault of the Jews. He says that it would be better to advise the Muslims on how they could integrate while maintaining their identity. Inteviewed by the Belgian State TV channel, RTBF, Radouane Bouhlal, president of the Movement against Racism, Antisemitism, and Xenophobia (MRAX)  says that it's a little exaggerated, but that Phillipe Moureaux should have been more careful with this sensitive subject. Bouhlal says that unfortunate statement should not substantiate the idea that an all-powerful "Jewish lobby" is capable of setting policies, for example on the right to wear a headscarf. Because, he says, "this fantasy exists in the Muslim community". The president of MRAX doesn't agree with the CCOJB, though. He says it's "excessive", and that by speaking this way they feed another fantasy, that of the Jew who can't suffer any criticism. Bouhlal says that we "should avoid crying wolf all the time and focus on the real abuses". Boycotting Israel: what about Sahara and the Norwegian Oil-fund ? "Israel is perhaps the only country on earth with which Norway has strained relations, and ask ourselves "how has it come to this?"" The Norwegian Oil-fund is invested in holdings throughout the world. For ethical reasons it has divested from Wal-Mart (USA) and Elbit (Israel), which makes many Norwegians recall how Finance Minister Kristin Halvorsen [photo] on January 8th of this year marched under a banner saying "USA and Israel axis of evil". It is also worthwhile recalling how LO (TUC) leader Roar Flåthen singled out one country – Israel – for criticism in his May 1st speech this year. On a very basic level the question is whether it makes sense for the Norwegian Oil-fund to divest from precisely Wal-Mart and Elbit, while continuing to invest in companies which are guilty of far graver sins. On another level we might observe that Israel is perhaps the only country on earth with which Norway has strained relations, and ask ourselves "how has it come to this?" If Norway cannot ethically invest in Elbit, then where can we invest ? Partner: ACV/CSC (Confédération des syndicats chrétiens de Belgique). The talk will be held at the unions' headquarters in Brussels. The BOYCOTT of Israel ! A talk about the Boycott Divestment and Sanctions Movement"
"It saddens me, today, that they [Jews/Jewish leaders] deny the right of diversity to Muslims." A: Basically, yes. There were times when, because of lack of support within the Socialist Party, I accepted stopping this movement. On sensitive issues, we must advance when a door opens. That I could push through the law against racism, in 1981, is because of the commotion caused by an attack against Jewish children in Antwerp [Palestinian terrorists perpetrated this attack and not Belgian antisemites or racists as could be interpreted from what Moureaux says ]. At the age of 20, when I was a Marxist, I was not a big supporter of the right to diversity. I evolved. And what made me turn around is precisely the conversations I had with representatives of the Jewish community. It saddens me, today, that they deny the right of diversity to Muslims. According to Joël Rubinfeld, chairman of the CCOJB (Umbrella Organization of Jewish Institutions of Belgium), the phrasing is vague, "but it's clear that he stigmatizes a community unnecessarily". He points out the the number of anti-Jewish acts has increased since 2000. Rubinfeld says he doesn't understand what right to diversity the Jews have enjoyed. What privileges have they received that they would deny their fellow Muslims, he asks. And who among the representatives of the Jewish community denies this alleged right to diversity to the Muslim community in the country? Europeans just can't stop heaping criticism at Israel. Israeli officials on Sunday responded harshly to remarks over the Goldstone Commission's report on Operation Cast Lead made by British ambassador to the UN John Sawers, saying that London could become a target of legal action if it decided to back the report. "London, which is also in the midst of a war against terror, could find itself in handcuffs if it supports the document," officials told Army Radio. After convening a meeting to instruct senior diplomats to refrain from issuing separate statements to the media following the diplomat's interview, the Foreign Ministry in Jerusalem expressed hope that the remarks reflected his personal opinion only and not London's official stance on the issue. The radio station quoted sources in Jerusalem as saying they believed a consensus that the Goldstone report is not a valid legal document was beginning to crystallize. In an interview earlier Sunday, Sawers told Army Radio that both Israel and the Palestinian Authority must examine the findings of the report. The report entails "serious information," that raises suspicions that violations took place during the operation, Sawers said. The tactics used by both sides returned to them "like a boomerang," he added. Sawers said that he was surprised that the PA had asked to defer until March the UN Human Rights Council-planned endorsement of the report. He also expressed dismay in the fact that both sides failed to cooperate with the commission, adding that the report represented this lack of cooperation. The ambassador asserted that the judicial authority in Israel, like in his home country, is entirely independent, adding that Britain cannot prevent private persons from filing complaints against Israelis. However, he said, Britain is obviously interested in maintaining normal relations with Israeli politicians and military officials that visit the country, insisting that the state would not by any means prevent them from visiting. In late September, a British court rejected a petition urging an arrest warrant for Defense Minister Ehud Barak on the grounds that he committed "war crimes" during Operation Cast Lead. The court accepted arguments submitted by the British Foreign Office, which said the defense minister was a state guest, and therefore was not subject to such lawsuits. Barak was in Britain for talks with Prime Minister Gordon Brown, Defense Secretary Bob Ainsworth and Foreign Secretary David Miliband. "We do not intend to let terror win," Barak said in a statement issued by his office. "We will not apologize in any way for our just struggle against terrorism. We will do everything possible so that the representatives of Israel, security officials and soldiers of the IDF will continue to freely travel the world. The theater of the absurd whereby those who defend their citizens need to be on the defensive has to end. Otherwise, the world is likely not only to give a prize to terrorism, but to encourage it." "What is the driving force behind anti-Israel sentiment, when nations far worse than Israel in every respect get off scot free ? Iran awakens nowhere near the same degree of hostility, and as for Syria and Libya they are hardly on the map." Norway gets on fine with Saudi Arabia and China. With Russia there is the odd scuffle over investments and fisheries, but as long as Norway remains the only neighbor of Russia not to be invaded by her, we are pretty much content. We do not care much about Sudan. With Israel however we have a relationship which, diplomatically put, "could be better". Why is this? We are told that the driving force behind the constant criticism against Israel is not anti-Semitism. Absolutely not ! The thought in itself, our Norwegian readers tell us, is ludicrous. Very well. Then what is the driving force behind anti-Israel sentiment, when nations far worse than Israel in every respect get off scot free ? Iran awakens nowhere near the same degree of hostility, and as for Syria and Libya they are hardly on the map. "In my academic career I had never heard about any Norwegian university, until a variety of newspaper articles and e-mails drew my attention to the anti-Israel hate seminars at NTNU and the fact that it was the first time ever in a democratic country that such a series was sponsored by a university rector. I have since looked in some detail into the attitude of Norwegian governments towards Israel and the Jews. It seems to me that it is much more important for NTNU’s students that the rector sponsors a seminar on this subject. It could include many topics, such as Norway’s long history of anti-Semitism, the scandalous restitution process after the Second World War and the systematic obstruction by many authorities during the renewed restitution process in the 1990s. Other subjects could be Norway’s own ethics and those it demands from Israel, double standards in behaviour and ethics towards Israel and Arab countries, media bias, internationally pioneering anti-Semitic acts in Norway, and so on." Is this a comment worth reflecting upon, or shall we resort to angry rejection? This is a decision it is up to the editors of Akersgata – Norway’s Fleet Street – to decide upon. "... more than 50,000 EU citizens are living in towns and villages at the southern areas of Israel, nearby the border with Gaza, and they are exposed to consistent Palestinian terrorists’ rocket attacks. Most of the EU-Israelis, like all other Israeli civilians in these areas, are suffering from mental trauma and some of them have suffered severe property damages. The EU must take responsibility for them and prevent any EU financial assistance from getting to terrorist hands in Gaza." "Fifteen European citizens living in Israel are taking legal action against the European Union for failing to protect them from Palestinian rocket fire while they are living in Israel". The citizens, of Britain, France, Italy and Hungary, who are all currently living in Israel, have filed a claim with the European Commission demanding that the EU intervenes in the funding of terrorism in Gaza, and takes action to protect them from terrorists while they live in Israel. All 15 litigants currently live in the southern Israeli town of Sderot, which has been an ongoing target of Kassam rocket attacks from the Gaza Strip. They are supported by the European Initiative, Europe's pro-Israeli lobby organisation. The group is demanding that the EU stops the transfer of European money to Hamas, prevents known terrorists and their leaders entering the EU, and prevents non-profit organisations misusing European funds. They also ask the EU to undertake “any means possible” to protect European citizens living in Israel against terrorism. The European Commission has confirmed the complaint has been received from lawyers Mordechai Tzivin in Israel and Hugo and Roel Covaliers in Belgium. It has been sent to the Commission’s external relations department. Mr Tzivin said: "The European Initiative estimates that more than 50,000 EU citizens are living in towns and villages at the southern areas of Israel, nearby the border with Gaza, and they are exposed to consistent Palestinian terrorists’ rocket attacks. "Most of the EU-Israelis, like all other Israeli civilians in these areas, are suffering from mental trauma and some of them have suffered severe property damages. "The EU must take responsibility for them and prevent any EU financial assistance from getting to terrorist hands in Gaza"." Sweden supports the Goldstone Commission's report into Operation Cast Lead, the country's foreign minister, Carl Bildt, said Thursday. 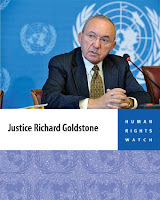 Bildt told reporters in Stockholm that South African judge Richard Goldstone was a person with "high credibility" and "high integrity" and that his report carries weight. He said the probe, which alleged that both Israel and Hamas committed war crimes during last winter's Israel offensive against Gaza, is worthy of consideration. He added the right place for deliberations about the report was the UN Human Rights Council. Earlier Thursday, Bildt told Swedish Radio that Israel made "a mistake" by not cooperating with the probe, which he called "independent" and "serious." Sweden currently holds the rotating 6-month presidency of the European Union. Does Europe have a problem with Israel? In a new book, A State Beyond the Pale (Weidenfeld & Nicolson), Robin Shepherd writes that Israel is being treated unfairly in the quantity and quality of attention it receives in Western Europe. Shepherd does not focus on all criticism of Israel — only the steady slide towards demonisation and the occasional use of old anti-Semitic tropes. Shepherd's well-documented, elegantly written and powerfully argued book is a must-read for anyone interested in this subject. Two recent instances of Israel-related press coverage and the political response they elicited suggest he is spot on. First, the mass-circulation Swedish tabloid Aftonbladet published a story by Donald Bostrom which alleged that the Israeli Army had systematically harvested organs from the bodies of dead Palestinians. The only established fact was the death of a Palestinian youth whose family had claimed that his corpse had undergone an autopsy without their authorisation. Bostrom later confirmed that he had no conclusive evidence to back up his story. When Israel protested, asking the Swedish government — the current holder of the EU presidency — to distance itself from what many saw as a 21st-century blood libel, Sweden barricaded itself behind the absolute principle of press freedom. Instead of criticising Aftonbladet, it reprimanded its ambassador to Israel for having dared condemn the article without prior co-ordination with Stockholm. In mid-September, however, Sweden's government asked a Stockholm museum to remove a display of swastikas and female genitalia to avoid hurting sensitivities during an EU foreign ministers' meeting. What's the Swedish for "consistency"? A few weeks later, the Spanish newspaper El Mundo also had a little spat with Israel. On 5 September, it published an interview with the Holocaust denier David Irving as part of a string of articles marking the 70th anniversary of the start of the Second World War. When the Israeli ambassador protested, El Mundo flew the flag of press freedom, implying that Irving's views — while not those of the paper — might be of public interest as long as they were not inflammatory. The ambassador was accused of having a Manichaean view of the world. The editor must have missed the irony of rejecting the Israeli ambassador's claim that El Mundo was delving into moral relativism by calling his view "Manichaean". Ultimately, what Irving said in the interview was irrelevant. An interview in a prominent publication is a place in the sun and El Mundo gave him one. It is worth noting that, in contrast to his Swedish colleague Carl Bildt, who chose silence in the wake of Aftonbladet's piece, the Spanish FM, Miguel Moratinos, took a robust view: "The Foreign Minister, while maintaining the most absolute respect for freedom of expression, regrets that space was given to an historian who denies one of the biggest tragedies for humanity in modern history," said a spokesman. Bildt, who was scheduled to arrive in Israel on official EU business on the same day that Irving's interview was published, had to cancel his trip. Moratinos, whose country will assume the EU presidency after Sweden, visited Israel as scheduled a week later. It appears that for European editors no doubt familiar with the significant restrictions on press freedom that exist in our heavily regulated continent, Israel is an exception. To smear and slander Israel — or the historical record of the Holocaust — is an absolute right. The Aftonbladet story was less about press freedom and more about a journalist relinquishing any pretence of fairness when a chance to promote a cause to which he is sympathetic came up. A journalist writing such lurid accusations without evidence against any other government would lose face with his colleagues. In this case, Bostrom's colleagues rallied to defend him instead of criticising the likely long-term damage he caused to their profession. Even when bad taste does not stand in the way of editorial choice, freedom of the press is not the same as the obligation to give a platform to every crank. El Mundo's editor, while waving the flag of press freedom, deleted the Israeli ambassador's letter's last and most damning paragraph, which suggested that his choice to publish Irving was dictated by sensationalism. El Mundo and Aftonbladet both crossed a red line — making the outrageous legitimate and the extreme mainstream. The thread that runs through their stories is the singling out of Israel to apply a principle they follow less strictly elsewhere. Perhaps, in the editors' minds, Israel is indeed "beyond the pale". JERUSALEM (AFP-EJP)---Israeli Vice Prime Minister Moshe Yaalon recently cancelled a planned trip to London over fears that he could be put on trial for alleged war crimes, his spokesman said on Monday. He called off the trip for fear pro-Palestinian groups in London might seek his arrest for his role, as military chief-of-staff at the time, in the 2002 deaths of 15 people, among them a Hamas leader and eight children. Yaalon, who is also strategic affairs minister, had been invited to attend a fund-raising dinner hosted by the British branch of the Jewish National Fund, but the foreign ministry's legal team advised against it. 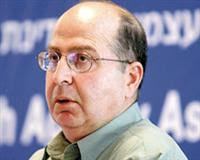 Yaalon was military chief-of-staff when an Israeli warplane dropped a bomb in Gaza City which killed Salah Shehadeh, the head of the armed wing of Hamas, and 14 civilians, including his wife, in July 2002. Last Tuesday Israeli Defence Minister Ehud Barak branded a bid to have him arrested in Britain "absurd" as he attended the governing Labour party's annual conference. British activists had sought his arrest over Israel's turn of the year operation in the Gaza Strip. The request was denied on the grounds of diplomatic immunity. In 2005, Doron Almog, an Israeli general and former head of Israeli army’s Southern Command, warned that he could possibly be arrested if he alighted from his plane at London's Heathrow airport. He remained on board the plane for two hours until it returned to Israel. 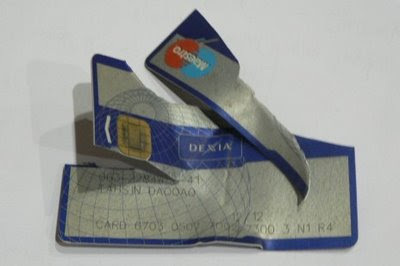 Contrary to these claims (Dexia Israel stops financing Israeli settlements, U.S. Campaign for the Academic & Cultural Boycott of Israel) the campaign in Belgium against the French-Belgian bank Dexia has been unsuccessful. The organisers are still at it, with the backing of Le Soir newspaper. The vicious images below tell the whole story. What has the U.S. to do with this ? Nothing, except that the organisers don't like the U.S. either. The Goldstone report is primarily based on statements, publications, and submissions from highly politicized and biased non-governmental organizations (NGOs), many of which are funded by European governments. This broad reliance on secondary sources lacking credibility contrasts with the claims to have conducted a "fact finding mission", and to have subjected claims to critical examination. 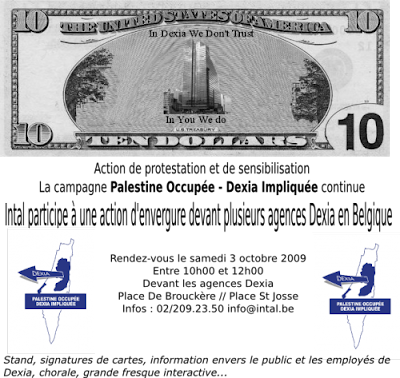 Beyond adopting the flawed methodologies and false claims, the funding provided for these NGOs links European governments to the Goldstone report, and its contribution to anti-Israel demonization. The highly biased allegations, and the visibility they receive, are enabled by the same European government funding for NGOs that propels other aspects of the Durban Strategy. This intense effort is based on the exploitation of the rhetoric of international law and human rights to promote demonization of Israel. Similarly, European-funded political NGOs – such as PCHR, Al Mezan, Al Haq, and Adalah – are at the forefront of the "lawfare"campaigns that abuse the universal jurisdiction provisions in the legal codes of a number of Western countries using allegations of "war crimes." As with the attempt to secure an arrest warrant against Ehud Barak in the UK (led by Al Mezan and Al Haq), the goals are negative publicity for and delegitimization of Israel, not "justice." The following NGOs are used as sources in the Goldstone report. (Funding information is followed by an excerpt from the report and testimonies based on each NGO; these examples are not exhaustive). As seen in many of the excerpts, the NGO allegations were often unconnected to the conflict in Gaza or to the inquiry’s mandate, but were included in NGO submissions and the report’s text as part of a wider effort to condemn Israel and remove the context of terrorism. Sadly, the same hatred like elsewhere in Europe. Violent antisemitic incidents occurred in 9 cities: Athens, Salonica, Larissa, Volos, Ioannina, Corfu but also in Judenrein cities such as Komotini, Veria, Drama. Nationwide we saw outrageous statements on "blood craving Jews" by Extreme-Right leader Y. Karatzaferis, while Leftist leaders went overboard in condemning Israel but downright refused to condemn antisemitic incidents in their own home; especially their utilitarian reference to the Holocaust would have been tragic if not comic compared to their downright refusal to join the State Holocaust Memorial Day later in the month as they usually do. Members of the Greek Church like Metropolitan of Piraeus Serafim spoke of "Zionist monsters with sharp claws" being aided by "masonic lodges". Metropolitan of Salonica Anthimos, already famous for other anti-Jewish statements, said that Jews are being punished for killing Jesus Christ. The "Christ-Killer" card was also played by newspaper frontpages like Vradini speaking of the "Crucifixion" and "Ponzio Pilates". 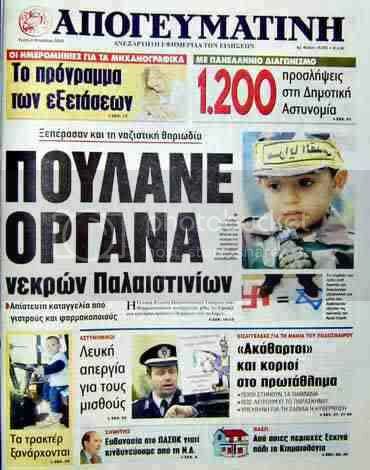 I won’t even mention the paranoid antisemitic Christian Orthodox newspapers like Orthodoxos Tipos which frontlined "Zionists and Masons support the slaughtering", but I will limit myself to the infamous antisemitic newspaper Avriani which spoke of American Jews stealing the money and causing the world economic crisis and warned us of American Jews plotting to set off WW3 [photo above] (!!!) while also frontlining "Holocaust". 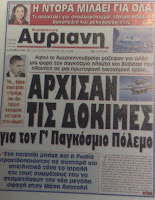 Let’s not forget newspapers like Apogevmatini which frontlined the "Holocaust" and which had already accused Israelis of harvesting Palestinian organs long before the Swedes ever discovering the rumor and all the other newspapers which refused to talk about the wave of antisemitic hatred that swept through Greece. The press and TV did their best to exasperate the climate – a known liberal radio presenter, Jimmy Panousis, said it plainly: "There are no good Jews" and that Jews are pigs and murderers but fortunately their days are numbered.